A city featuring a mix of historic styles of architecture dating from the occupation of the moors and romans, the old town centre of Cordoba was designated a UNESCO site in 1984. 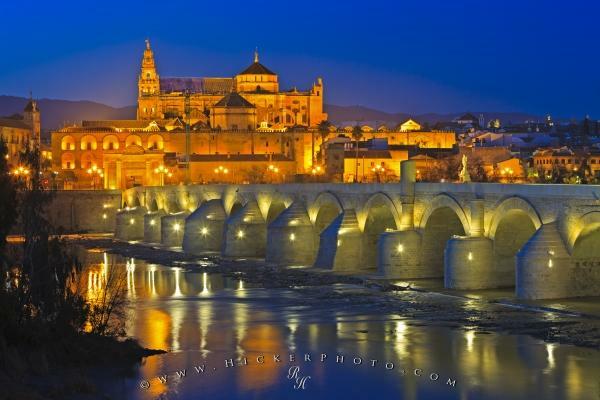 Originally founded in the Roman times, the city of Cordoba in the southern region of Andalusia, Spain has been subjected to many different cultures and religions. These cultural and religious influences are seen throughout the city and are reflected in the many historic buildings and unique architecture of Cordoba. Puente Romano (bridge) spanning the Rio Guadalquivir (river) and the Mezquita (Cathedral-Mosque) during dusk in the City of Cordoba, UNESCO World Heritage Site, Province of Cordoba, Andalusia (Andalucia), Spain, Europe. Pictures from photo gallery "Travel Backgrounds"
This picture is part of the photo album "Travel Backgrounds" - there are more beautiful images waiting for you.